Once considered a breed of “no beauty,” the Narragansett Pacer moved fast enough for an 18th-century rider to cover 50-60 miles a day of rocky New England ground. As a natural pacer, its backbone moved through the air in a straight line without inclining the rider from side to side. Bred in and named for a southern community of coastal Rhode Island, the story of Narragansett Pacer horse is tightly entwined with the history of the early slave trade. Throughout the 18th and 19th centuries, these horses were traded for rum, sugar and slaves. Often, the horses were raised by slaves on the plantations of Narragansett, then shipped around the Atlantic World to work on sugar plantations alongside other slaves. By the nature of the region’s rich soil and easy climate, the Narragansett planters were stock and dairy farmers who exported butter, cheese, livestock and lumber. Interestingly, it was the breeding and exportation of Narragansett Pacers that proved far more lucrative. The importation of horses to New England began a decade after initial settlement of Plymouth, but when they were first reached Rhode Island is unclear. John Hull, treasurer of the Bay Colony and a prominent merchant, was among the first to consider the development and maintenance of a pure strain of Pacer in 1672: “if we…procure a verry good breed of large & fair mares & stallions…wee might have a verry choice breed…& …shipp them for…the Indies.” How Hull’s plans progressed is unknown, as there is an acute absence of studbooks, and estate inventories are vague. Pacers did particularly well in hot climates, which was why they were exported to the Caribbean and to South America. The horses were in high demand in the non-English islands since it was horses, not windmills, that turned the sugar mills. Advertisement, Providence Gazette, January 1764 (RIHS). James Brown and his son Nicholas of Providence were key players in the shipment of Pacers to the Dutch colony of Suriname. As the number of plantations grew, Suriname emerged as a leading producer of sugar, coffee, cocoa, and cotton. 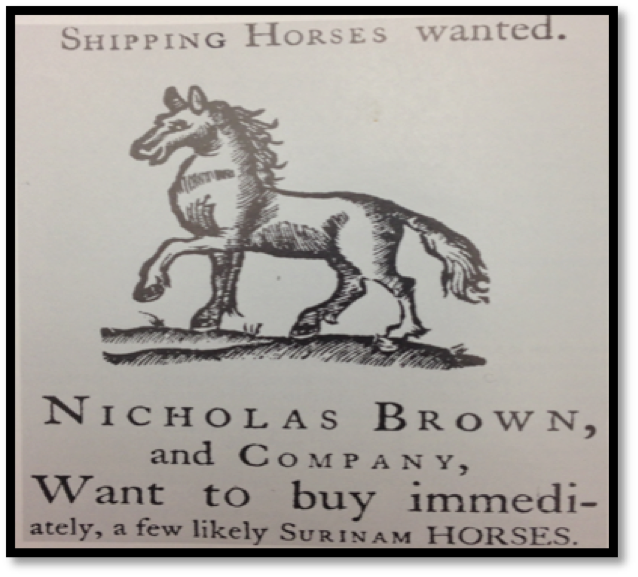 An advertisement from the Providence Gazette in January 1764 announced that “Nicholas Brown and Company want to buy immediately, a few likely Suirnam horses.” The Brown family had specific expectations of the horses that they needed to ship out. The most desirable horses were aged between 3 and 8 and under 14hh (143cm). They made repeated requests for horses “in good care”: “free from lameness,: with “two good eyes” and “good teeth.” The weight of the horses was important too and “Good fatt horsis” were most desirable. Their letters reveal a genuine sense of urgency. For example, Nicholas wrote to Isaac Trip that “In order to forward the horses as soon as possible…our vesel being ready much sooner than we expected & there being many other vesels who will get away before the 15th.” In March 1765 Nicholas contracted Isaac Tripp to purchase “Forty Horses…fitt for the Suranam Markkett.” With hard money in short supply, he proposed to pay for the purchase in goods, including rum, sugar and molasses. In addition to edible and drinkable goods, Nicholas also proposed to pay in human goods with “one Negrow Garl.” The Brown family sourced the horses from plantations in Rhode Island, where they were raised by slaves, and then sold them to toil alongside slaves on plantations in Suriname. A.S. Gent, The Gentlemans Complete Jockey (London, 1700). Cover page. 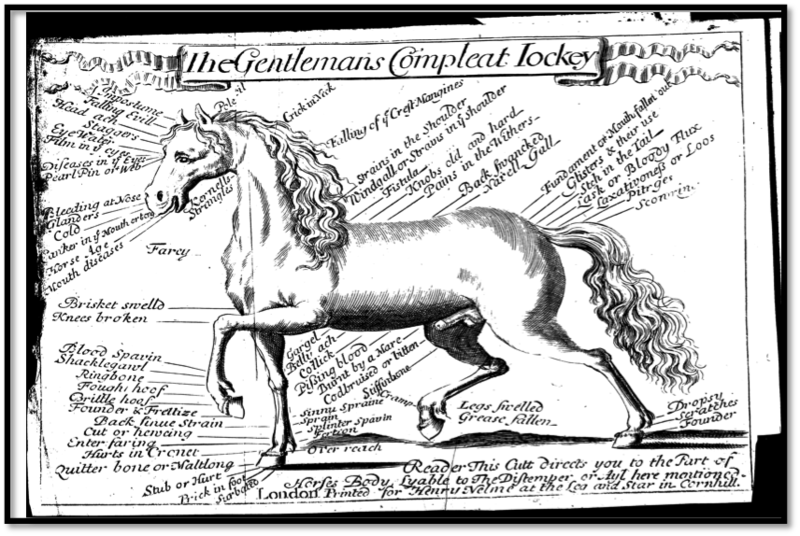 Another advice pamphlet, the 1700 London version of The Gentlemans Complete Jockey, offers a detailed discussion of how to “fatten a lean horse in a short time.” The author suggests “Mashes made of boiled Oats, Beans, and Bran…Balls of Barly-meal, Honey, Enaula campane beten into-powder, the Juice of sweet Fennel, and Cummine-seeds…with new Ale.” Sadly, we do not know happened to the horses and if they survived. By the turn of the 19th century, Narragansett Pacers had started to disappear in Rhode Island and the breed eventually became extinct in its pure form. The story of the Narragansett Pacer raises a host of new research questions. Why did the first truly “American” horse fall into extinction? How does the economic web of Rhode Island horse breeders and Dutch planters change our view of the Atlantic slave trade? Is there any truth in the rumour that Paul Revere rode a Narragansett Pacer during his famous midnight ride of 18th April 1775? 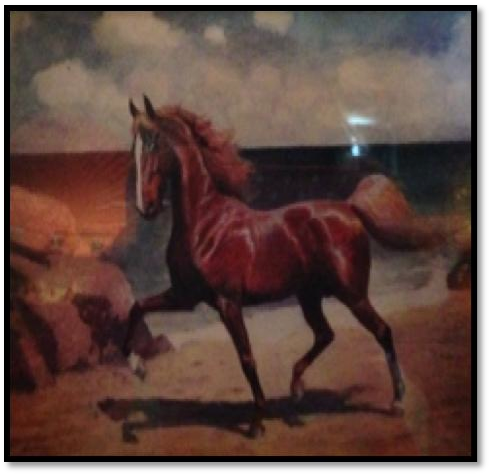 What is the legacy of the Narragansett Pacer and how has it contributed to modern American horse breeding? Letter dated September 8 1672 to Benedict Arnold, ‘John Hull Letter Book,’ vol. 1 transcribed by Florence Berlin for the American Antiquarian Society (1930) Further letters re: horses, pp. 132-133, pp. 337-338 of the transcript. The woodcut of a Narragansett Pacer appeared in the Providence Gazette in January 1764. Advertisement courtesy of Rhode Island Historical Society Rhi x3 1740. See for example: Providence 23 May 1765, John Carter Brown Library, Providence, RI. Manuscript – BFBR B. 357. ML 1764-1767; BFRB Miscellaneous Letters, 1765 B. 357. Folder 3, Folio 11 Hereafter referenced as ‘Nicholas Brown Papers’; Febry 3d. 1735/6 The Letter Book of James Brown of Providence, Merchant 1735-1738. From the original manuscript in the Rhode Island Historical Society. (Providence, RI: Rhode Island Historical Society), p. 19. Hereafter referenced as The Letter Book of James Brown. January the 21th Ad. 1737/8, The Letter Book of James Brown, p. 49. November 1765, ‘Nicholas Brown Papers,’ Folder 4 folio 16. Providence 11 March 1765, Ibid, Folder 3, Folio 1. 15 November 1765, Ibid, Folder 4, Folio 19. 20 December 1765, Ibid, Folder 5, Folio 14. 20 December 1765, Ibid, Folder 5, Folio 15. A. S. Gent, The Gentlemans Complete Jockey (London, 1700), p. 18. This is very interesting. I wonder if there is any evidence on what slaves’ relation to the horses were. As an instrument of labor, sure, but it would be fascinating to uncover instances where enslaved people butchered them (for sabotage or food), used them to escape, etc.